Peanut butter is one of my favorite treats. I eat it straight from the jar for a quick but healthy snack, spread it on toast for a speedy breakfast, and add it to smoothies to add calories after a workout. I LOVE peanut butter! However, not all peanut butters were created equal. Some store-bought brands are made with added sugar and cheap vegetable oils that are actually high in trans fats making them really unhealthy. 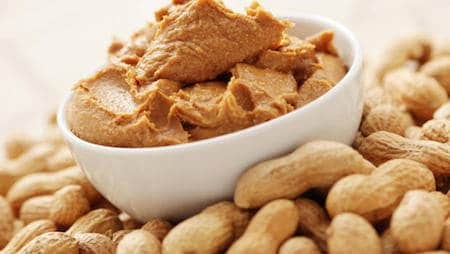 Making peanut butter is easy when you use your food processor – and if you don’t like peanuts, you can use almonds or almost any other nut instead. Heat the oven to 350°F and toast the peanuts on a baking sheet until lightly golden and glossy with oil, about 10 minutes. Allow to cool. Transfer the peanuts to a food processor. Pulse a few times just until chopped. For chunky peanut butter, remove 1/2 cup of chopped nuts and set aside. Run the food processor continuously for 1 minute. Stop and scrape down the sides and bottom of the bowl. At this point, the peanut butter will look gritty and dry, almost like couscous. Run the food processor continuously for another minute, then stop and scrape down the sides. At this point, the butter will start clumping together. It’s not quite peanut butter, but it’s getting there! Run the food processor for another minute, then stop and scrape down the sides. At this point, the butter will be glossy and soft, like very thick peanut butter. Sprinkle the salt, oil, and sweetener over the top of the peanut butter. Continue processing the butter until it becomes completely smooth. Homemade peanut butter will still be a little grittier than store-bought peanut butter, but should be spreadable at this point. Taste and add more salt to taste. If you reserved some nuts for chunky peanut butter add them now and pulse a few times to incorporate. Scrape the peanut butter into an airtight storage container, cover, and refrigerate. The peanut butter can be used immediately and will keep for several weeks in the fridge.